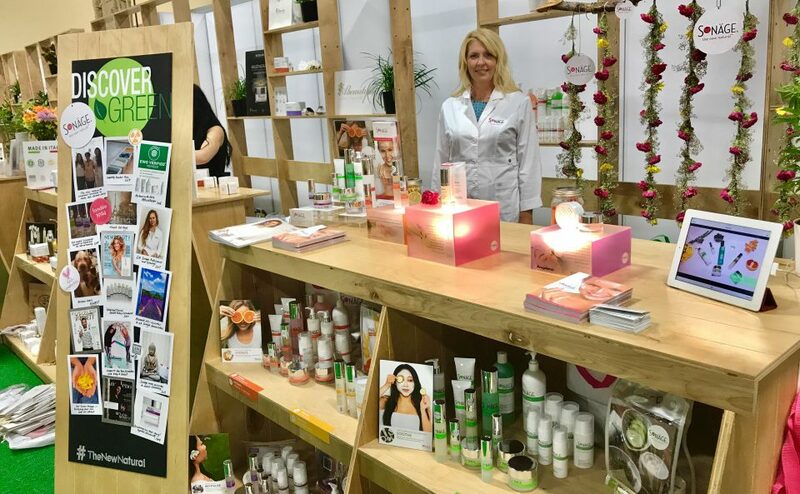 You know a tectonic shift is occurring in the industry when Cosmoprof North America — the largest professional beauty show in the U.S. — hosts a Discover Green section to promote natural and non toxic beauty brands. Towards the end of last month, Mary Bemis, Editor of Insiders Guide To Spas, published a report, “Let’s Keep Green Beauty Growing.” To be featured in any publication is always an honor, but the real sense of pride came from the affirmation that there is an industry-wide felt shift: green beauty is becoming more mainstream. 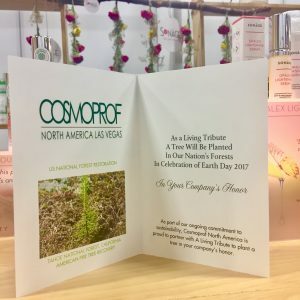 But, actually our excitement for the greening of the industry — exemplified by Cosmoprof’s Discover Green — has been brewing long before this marvelously uplifting report was published. Since success is often tricky to quantify, we will feed two birds with one scone (we love animals 😉) — summarizing our debut at Cosmoprof North America’s Exhibition in Las Vegas as telltale signs of a changing world. This year, the Discover Green section doubled from 20 to 40 brands and judging by the atmosphere this year, we are willing to bet the section is only going to continue growing. The crowd was electric: every booth with a unique story and emanating scent of botanicals. Passersby keen to learn of the healing powers of mother nature and open-mindedly experiencing all that was to offer. We have operated in a world where the term ‘Green Beauty’ had a certain smell to it. One where all-knowing smirks and rolling eyes can’t fathom nature holding up against dermatologist-recommended-prescription-strength chemicals? But, last weekend, witnessing the palpable buzz in the Discover Green section validated our efforts and instilled a unified feeling of triumph: green beauty is here to stay. The New Natural™ Comes Naturally, we strive for a world where natural, non toxic skincare is the norm. Where ‘green beauty’ is just ‘beauty.’ Well, ask and you shall receive! Living in Discover Green for three days was exactly like coexisting in our own beauty utopia. If every brand uses clean, natural ingredients, you must have something extra — your own unique story — to be interesting and relevant. How refreshing a feeling this was to plan, to voice out loud while brainstorming, “Everyone will be singing the natural song, how can we stand out?” We are and always have been a French-heritage professional brand with spa-grade skincare products. We just happen to use natural ingredients. We finally got to tell our actual story as a beauty brand and display our achievements as polaroid-esque images to highlight our milestones. Like our revolutionary anti-aging system in 1994 where we introduced peptides with Biosyl Peptide Booster. Or when we unveiled our advanced clinical patient protocol in 2001. Or even in 2004 as first-movers when we discovered the benefits of hyaluronic for wound healing. We have so much to tell about our brand, using natural ingredients should just be an accepted given. 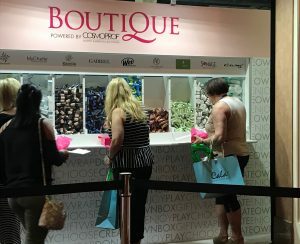 Cosmoprof launched an onsite sampling boutique where attendees couldchoose seven deluxe samples from a selection of 20 brands, with proceeds going to charity. We chose to introduce our brand with EWG Verified Botánica Soufflé Crème — our light, fluffy moisturizer with a garden’s worth of botanicals. To be featured in such a grand display amongst other green beauty brands felt like another huge achievement and step in the right direction for the industry. To reiterate Sign #2 — we are super proud to be EWG Verified, but it is not our only selling point. In fact, for EWG’s mission to be effective and for our certifications to have influence, we love seeing other EWG partners! That’s why we were so happy to learn of other members at Discover Green — sharing similar values and striving for safety in beauty. We’re sure we can speak for everyone when I say that everyone in the Discover Green section is committed to protecting our planet. But it was a delightfully welcomed reminder to learn that Cosmoprof planted trees in each of our honor in Tahoe National Forest. How far we as an industry have come that the world’s biggest beauty conference takes pause to give back to the planet and puts a spotlight on sustainability.